This is from a Bourbon cask, with the cask number 569. Sweet citrusy marzipan in the smell. Some grass and dirt in the background. This is far away from the classic Islay whiskies. This is like proper old school whisky! Malt, hay and white fruits, but with a spicy touch, in the taste. Some citrusy notes as well, but not much, and just in the background. The finish is hot but turns sweet very fast. Honey glazed pears, but still with the farm character. A fine dram that reminds me of good old whisky. Farm distilling! Like Kilchoman without the peat. 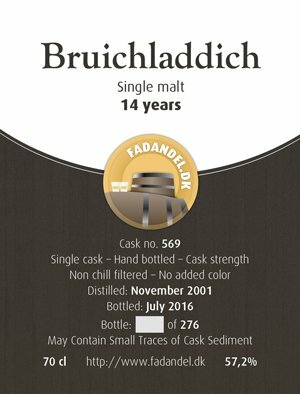 A perfect dram for the winter cold (minus 5 degrees here right now). I will give this 85/100 (21/21/22/21).